We have had some interesting fall weather this year. It was hot and sweaty one weekend and snowing the next! What!! It is way to early for snow in South Carolina! But for the most part it has been crisp and beautiful and we are loving every minute of it. Apple season came and went without us ever stepping foot in an orchard; but we did visited a small, local farm to find the perfect pumpkin. 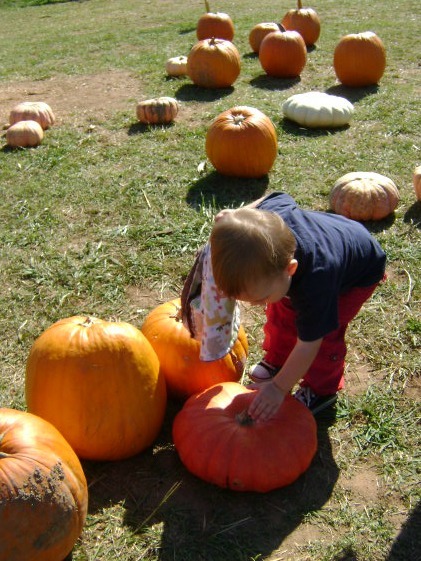 Henry excitedly ran around pointing to and patting all of the different “pie” (pumpkins). 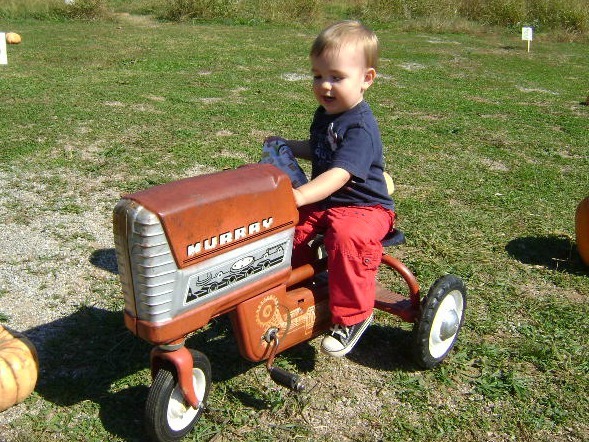 He was also thrilled to ride on each of the “too too” (tractors). Try as I may, there was absolutely no way Henry was going to look up and smile at the camera when he was so busy exploring. Next up were the farm animals. We walked around to see the lamas, goats, sheep and chickens. 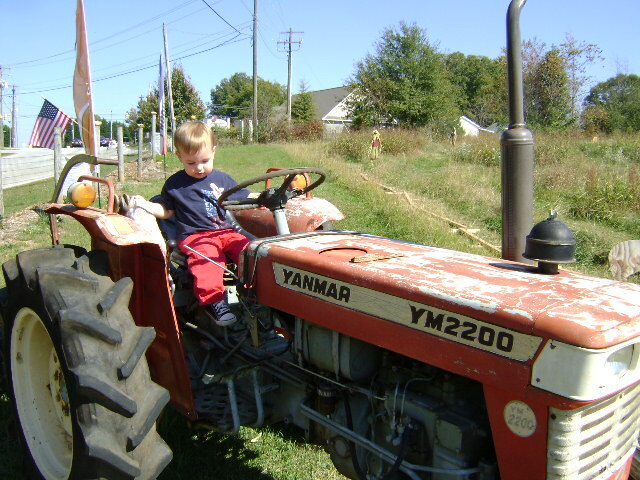 Then we went on a hayride and were able to see a donkey, pigs, more goats and fields with fall crops. I think Henry’s favorite were the sheep because they came right up to the fence and ate all of the grass that he picked and feed them. 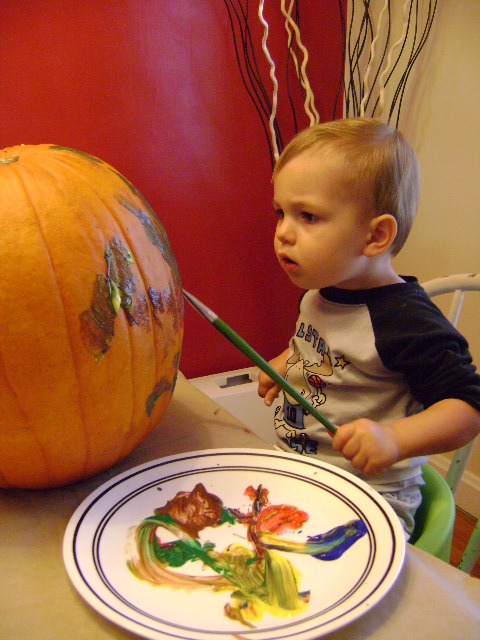 I wanted Henry to be able to decorate his pumpkin rather than sit by and watch us carve it so I decided to have him paint the pumpkin. First I added strips of painters tape to form an “H” for Henry and then encouraged him to paint all around the tape. 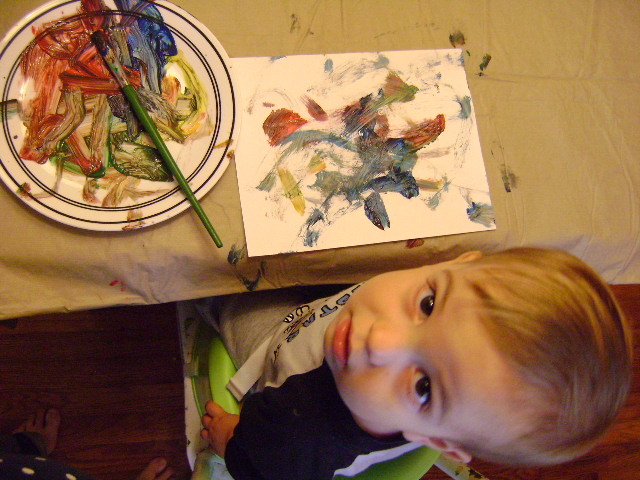 This was Henry’s first time painting with a brush and he worked very diligently to cover the entire area with paint. I loved his look of intense focus as he created his masterpiece. 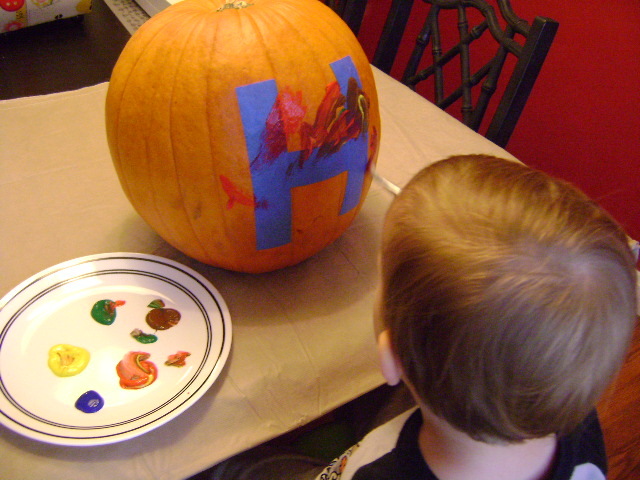 When the H was completely covered and he started applying too much paint in one area (mixing the colors into a muddy brown) I took away the pumpkin and let him paint on a piece of paper. 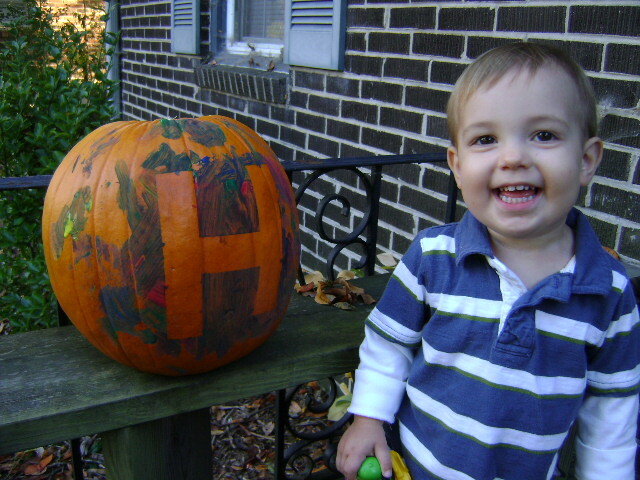 Once the paint had dried on the pumpkin, I peeled off the tape to reveal the H.
Henry was very excited to show off his pumpkin to Daddy that evening! 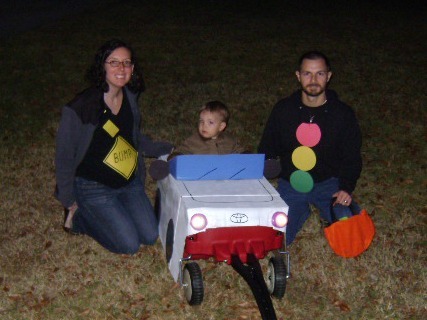 On Halloween we went trick-or-treating around our neighborhood. 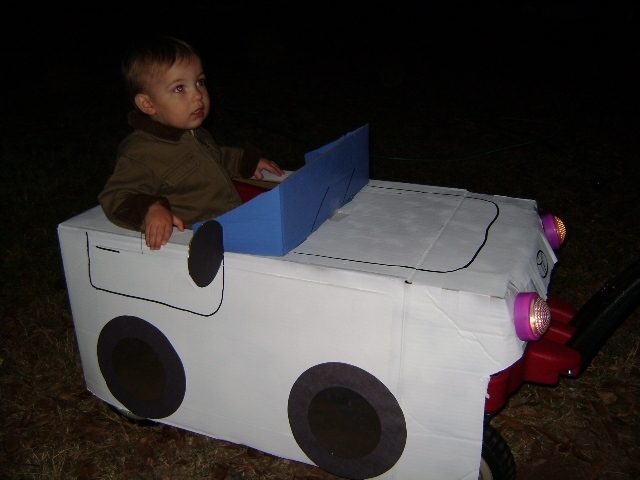 Henry thought his car was pretty cool and loved pushing the headlights to turn them on and off. He had no idea that we were collecting delicious candy but he sure did enjoy ridding around in his car and would point to the different houses he wanted us to go to. Here’s the whole gang! To see more of our costume details click here. Thank you! I hope that you’ve had lots of fun this fall.